Although generally thought of as an academic powerhouse first and foremost, Stanford University is no slouch on the field of play. 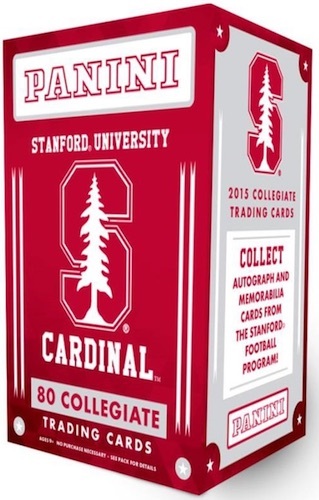 2015 Panini Stanford Cardinal Collegiate identifies the key collecting options from the school's athletic history and there may even be a card for the creepy tree mascot. There are some big names in the 50-card base set, including former stars of football, basketball and baseball. Andrew Luck and John Elway headline the football checklist that also includes James Lofton, Doug Baldwin and Toby Gerhart. Adding to that, 2015 NFL rookies Andrus Peat and Ty Montgomery are featured. Brook Lopez and Amber Orrange offer basketball options from both the men's and women's programs, and A.J. Vanegas is part of the baseball portion. Perhaps the most famous former student at Stanford, the 31st President of the United States, Herbert Hoover, is also included in the base set despite not representing the school as an athlete. However, Hoover was the student manager for the baseball and football teams during his time there. Fixating on the football program, there are also limited Signatures and Memorabilia cards to be found. Honors represents the sole insert and is devoted to the players who have received individual accolades such as the Sammy Baugh Trophy as the top college quarterback or the Doak Walker Award as the top college running back. The basic product is further expanded with Silver, Gold and Black parallels for the base and insert sets. Stanford University is just one of the many school-specific options found in the 2015 Panini Collegiate line. 49 cards. Player positions are noted below.